Burlap looks like a burned out clown with dyed hair (red) that is receding prematurely. He wears heavy leather with bells and lots of pockets (mostly full of cigars; his favorites). He wears rings on all of his fingers and his beard is braided. He is fit but a little lean and will not wipe that stupid grin off his face (unless he is ‘off the clock’). He loves as much eclectic color he can wear; stripes, dots, checkers, it doesn’t matter. His outfit clashes so bad it’s a miracle that he can prowl at all (he takes off bells to prowl but keeps them close for distraction). Transformable Arrows/Knives (2) 2D6+6 40"
Enchanted Bow a.k.a. Red Ryder Special 500’ Empower This feature will take normal arrows and double their damage against supernatural evil creatures. Bottomless Quiver 128 capacity The name is something of a misnomer, as there is a finite number of arrows. However, this ordinary-looking quiver that is treasured by archers, for it has a larger space on the inside than on the outside. Up to 128 arrows may be placed in one of these quivers, although only 20 show, plus the weight is only that of 20 arrows. The quiver looks like a normal container for arrows, except the number of arrows never seems to diminish (until the arrow supply gets to 20 or less). Now this quiver has one added feature if you have multiple sets of arrow you can call out which type and that will be all you find until you call out another type, or run out. Lightning Arrows: Heavy 6D6 750’ 30 Transforms into a lightning bolt! Never Ending Handkerchief 1	 1	 2	 Self	 5 minutes per	 n/a	 9.5 30’ (+5’ per level) of handkerchief can support 600 lbs. Diarrhea	 3	 2	 4 or 6	 60 feet	 30 seconds	 s	 22	 victim within two melees needs to go bathroom. Scardy Cat	 4	 4	 7	 90 feet +5 per 2 minutes per	 s/-2	 22	 The victim suffers from a HF of 6 to the small, 8 to the medium and 10 to the large. Follow the Bouncing Ball 7	 7	 25	 700 feet	 3 minutes per	 s 00 The victim will be compelled to follow the ball that is traveling in the 30X30. Unlimited Ammo	 7	 10	 24	 Touch	 2 melees per level	 Dodge with -2	 22	 One weapon by touch; all the damage is imaginary but real to the victim and will pass out when the damage has depleted SDC and HP. Trick Rings	 5 12 8 200 feet +100 feet per level 1 melee per level Dodge	 9.5 Magic rings that can connect; Each ring is thrown with a +6 to strike, as a Frisbee 3D6 damage, +2 to strike; Link Rings (PS 30 (20 supernatural) to break rings or 20 points damage). Magi can adjust the rings to any size. Talisman of Magic 1 Around my neck 50 P.P.E. Burlap is the seventh of fourteen children. He and his 13 siblings and parents are citizens of the Western Empire (well not citizens, more like slave stock). The family is owned by a man named Adeel; a peasant that got lucky one night and struck it rich in the casinos. To impress his friends and family he worked hard to build his wealth and eventually moved to the Northern Region of Caer Itom, capital of the Western Empire. To compete with the locals who had money in their families for generations, Adeel bought slaves and educated them so that he could use his money to other uses. Burlap and his brothers and sisters, finding relief from their predicament, served young Adeel and his family faithfully for eleven years before things changed for young Burlap. 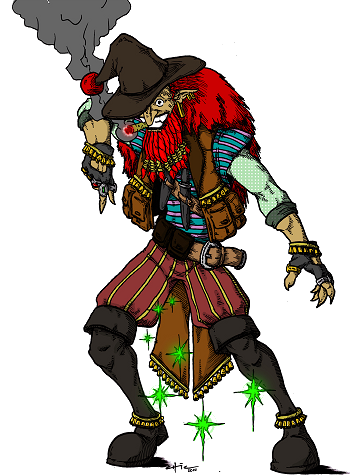 To further his power base Adeel had Burlap and his brother Behngay trained in the art of magic. Not being able to afford expensive wizard schooling, the lucky guy found some underground back street washed up Ludicrous Mage named Whanna and asked her to train his two slaves to be mages. The old woman laughed so hard she nearly died from the comedy of it all and agreed immediately going to work. In exchange for her work Whanna Siemyhinnie (Burlap is sure that isn’t her real name) was given a cottage in a secluded place to practice magic as ‘Funny’ Magic is frowned upon. The two students worked hard and learned quickly and Burlap learned to love humor. Still he was a reject of Western society and bringing humor to their somewhat humorless lives seemed impossible. Alas, he set out to do such a thing. The old Ludicrous Mage had taught him about the lay of the land and that there were opportunities to play tricks on people that would both free slaves and ridicule magic users country wide. Alas the prank he played on society didn’t work well and he was arrested. Adeel would not pay for his release and for the next two years he would sit in prison as happy as a loon. While some thought him crazy he had truly had come to be optimistic and would sing to himself and those around him. It was just recently that a mysterious female figure approached his cell, giving him a challenge: Serve Thoth and he would be free or serve his god Backsmack and go nowhere. Burlap weighed the issue for three days before he made his final decision. Finally he agreed. The terms of the contract were simple. Serve Thoth and leave the Western Empire and be promised to have the chance to spread laughter world wide. On the day that the young mage agreed, it would seem coincidental that Adeel had come to some new money and was able to pay for the slave’s freedom from prison. He said that in a dream he was shown money, instructions and was told to give the young slave his freedom. The hobgoblin wasn’t sure if he was kidding or not. That was either the king of luck of the draw or Thoth was really behind this. Going home with Adeel he kissed his family goodbye and set out to secretly liven things up a bit for the world. For the past six years the young mage has wondered the globe looking for his lot in life and what Thoth wants. He has worked in hospitals and carnivals; he has traveled with lawmen and criminals but to no avail to find what Thoth wants. Backsmack has visited the mage to see if he can regain his follower but the trickster god can not seem to wean him from his quest (though the two have had some real good laughs) and though the god has not got back the hobgoblin, he still keeps in touch with a promise of magic if he would just come back.